STYLE AND DESIGN INSPIRATION: Small in size and created in a Craftsman style, its boxy design is both charming and elegant making it a leading fixture in the Urban Ambiance portfolio. One of the world’s largest banking centers, Zurich is firmly established in international commerce. Many of the world’s elite hide their money in the infamous, Swiss bank accounts, The Zurich Collection borrows this philosophy. MATERIAL, FINISH AND WARRANTY: Made from high-purity acrylic with our dignified Parisian Bronze finish. Superior workmanship backed by a 10 year electical components warranty and a 3 year finish warranty (original purchaser). 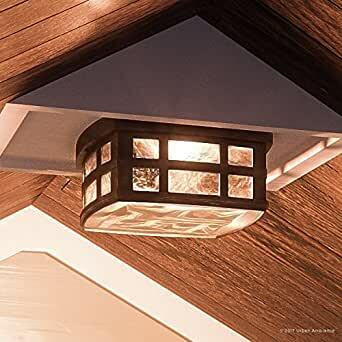 Small in size and created in a Craftsman style, its boxy design is both charming and elegant making it a leading fixture in the Urban Ambiance portfolio. One of the world’s largest banking centers, Zurich is firmly established in international commerce. Many of the world’s elite hide their money in the infamous, Swiss bank accounts, The Zurich Collection borrows this philosophy. Made from high-purity acrylic with our dignified Parisian Bronze finish. Superior workmanship backed by a 10 year electical components warranty and a 3 year finish warranty (original purchaser).